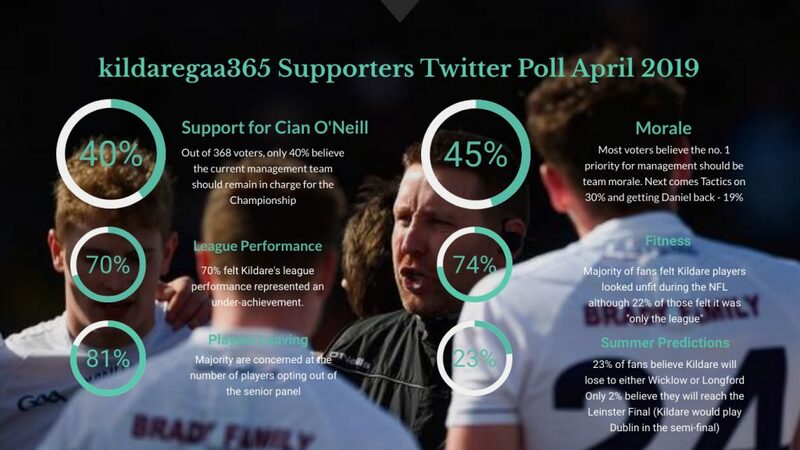 I took the plunge yesterday and launched a series of Twitter polls (@kildaregaa365) aimed at gauging whether Kildare football supporters share some or all of my concerns about the state of the Kildare senior football team and set-up. Firstly, I am not privy to what goes on within the panel and having the joys of living amongst our favourite neighbours to the East, I don’t hear all of the news on the ground in the county. As much as anything, therefore, I wanted to test the water with supporters to see if my own frustrations are mis-placed, unfair or unrepresentative. From my perspective, we finished 2018 on an apparently upward curve. The seniors had turned the season around from relegation and the Carlow debacle and performed admirably, if frustratingly unsuccessfully, in the Super 8’s. Of course before that there was #NewbridgeOrNowhere and that famous win against Mayo. Later in August, we witnessed something I’d almost given up on: a Kildare team winning an All-Ireland Final in football. All was positive and no one was looking for dramatic change. In the seven months that’s followed you’d struggle to pinpoint too many positives for the county. Two Mile House and Naas CBS spring to mind of course and fingers crossed Naas can finish the job in Croke Park at the weekend. But elsewhere we’ve managed to lose our winning under-20 manager from the county set-up. We had another rotation of selectors and backroom personnel. Our star forward upped sticks (though we still hope there’s a happy ending there), Johnny Byrne and Niall Kelly also opted out (at least for the league in the latter’s case), and a number of players seemed to have a look at the set-up during the O’Byrne Cup and stepped away again. The League was a disaster. Yes, injuries and the departures played their part. Yes, it was probably too early to blood the under-20’s en-masse (our poll was split on this issue). But you still would have expected a serious promotion push from a team who were in the Top 8 in league and championship the year before. It didn’t happen and the defeats to Fermanagh, Meath and Donegal each brought to the surface huge question marks about the spirit in the camp with long scoreless periods, collapses from winning positions and, particularly in the case of the supposedly crunch Donegal match, a complete absence of any apparent interest in proceedings from the players. Not to mention on-field discipline and an apparent lack of fitness. The final straw came this week with the reported departure of Moorefield’s Aaron Masterson and James Murray from the panel. Murray has been one of the stand-out defenders in Kildare club football for the last few years and while he has not imposed himself on the inter-county scene in quite the same way it takes time and he only made his debut ten months ago. He had been granted a mere five competitive starts since. Other than Jimmy Hyland, Masterson was the stand-out performer in Kildare’s under-20 win last year as well as playing a leading role in Moorefield’s Kildare and Leinster campaigns over the last two years. He is a selfless and talented leader and marked himself out as one of the country’s outstanding young talents. Now he’s gone – at least for now – from a panel that is not exactly endowed with midfield talent. He surely should have had more game time in the league. All of which brings us to the management. Cian O’Neill has had an uneasy relationship with the Kildare support in his three and a half years in the role. The initial football in Division Three was turgid despite the promotion and the League Final defeat to Clare a portent of some shocks to come. The attempt to switch to an all-out defensive strategy for the following championship fell flat against Wexford and Westmeath and we barely raised a whimper in the qualifying defeat to Mayo. Promotion again in his second year (2016) to Division One remains O’Neill’s number one achievement but the exceptional championship win against Meath and promising performance in the Leinster Final augured well. Armagh pricked that particular balloon and really it was downhill all the way with that horrendous losing streak all the way to Carlow. A four game winning streak in the qualifiers saved O’Neill’s hide last summer, despite three Super 8 defeats. But it’s been a wasted league since in many supporters eyes and there is no sign of any momentum. Seeing Meath resurrecting themselves and Laois and Westmeath coming up to join us in Division Two isn’t a very comfortable position for Kildare either. So what did our followers on Twitter think? Clearly, there is very weak support for Cian O’Neill as manager and he appears to be living on borrowed time again, just as he was after the Carlow defeat. He resurrected things then and the hope has to be that he will do so again. But was morale as bad (or at least perceived to be as bad) last summer? We didn’t have players leaving or rumours spreading around the county. We also had Daniel Flynn on board of course. Certainly the perception, inflamed by players such as Masterson and Murray leaving the panel, is that morale has hit a new low and when you see the second-half collapse against Meath and a complete lack of fight against Donegal, it’s hard to argue with that. We’d be curious to know whether the County Executive are similarly concerned about the year to date. But with County Board meetings only held once every three months, there’s no imminent chance for delegates to raise issues even if they were minded to do so.